About 200 soldiers have been marching through Stafford to mark their return from a six-month tour of Afghanistan. A Scimitar tank led the parade by the Queen's Royal Lancers ahead of the soldiers taking the salute from the mayor, Councillor Malcolm Millichap. The parade began in Earl Street before passing through Mill Street and Greengate Street to the Market Square. It started with a wreath laying and prayers at the town's war memorial before a service at St Mary's Church. Although the regiment is based in Catterick, North Yorkshire the 16th/5th Lancers were originally recruited from Staffordshire and amalgamated with the 17th/21st Lancers in 1993 to form the Queens Royal Lancers. 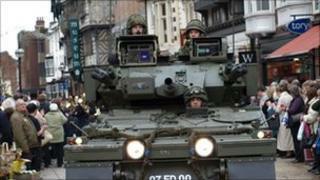 Stafford is home to the 22 Signal Regiment of the British Army and the Tactical Supply Wing of the Royal Air Force. Last month the mayor unveiled the town's so-called "Heroes" George Pillar clock in the town, dedicated to the men and women of Stafford who have served their country. Ian Thompson, chief executive of Stafford Borough Council, said: "There is always a great turnout whenever we have these parades as the community holds our service personnel in the highest regard and appreciate everything these brave men and women do across the world to protect the freedoms we enjoy."